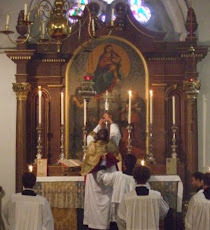 Fr Hunwicke's Mutual Enrichment: Liturgy and Vatican II: what did they think they were voting for? Vaggagini says somewhere "Three tendencies were manifested: some wanted no concessions to the vernacular; some wanted permission to say everything in the vernacular for all who wanted it; some wanted to maintain the basic principle of Latin, but also to open the door noticeably to the vernacular tongue." (The text of Sacrosanctum Concilium at para 54 actually reflects this stage of understanding very closely.) The last group, he said, were by far the largest. So, if you put that together, you clearly find that the overwhelming majority of the Council Fathers wanted at least to preserve a basically Latin Liturgy. And thought they were voting for this! Your commenter friend indeed had a useful insight. But he is mistaken in putting the initiative with Pius XII. As you sketch the narrative "over the decades" they traceably stretch back to the beginning of the century, and Pius X's reform of the Divine Office. These predatory "liturgists" were working hard outside and within Rome where Modernism was like leprosy but Liturgical studies offered a relatively safe haven. So much has been attained by them during and after the Council, through practised political manoeuvring, sleight of hand, and dissimulation, the producuct of which we obediently accepted in Faith, but subsequently rejected by declining to go to church. We came for bread and they gave us a stone. They should have read a little of English history, and the uprising of non-liturgists against "Christmas games". The Kasper-McCarrick-Bugnini Cult simply exploited the opportunity created by the cobbling of "spirit of V2 ambiguous language" into Sacrosanctum Consilium (SC), and did whatever they pleased. Kasper has publicly stated that he and his co-cultists made sure that the language of the V2 documents was packed with ambiguity, for the very purpose of doing whatever they pleased. Which just goes to show that for the Kasper cult, what "the council fathers thought" doesn't matter one single iota. Because for the Kasper cult, every event is an opportunity to betray scripture and tradition, whether by suffocating the orthodox or promoting the heterodox and heretical. I think, Father, that the character of Anatole Bugnini was a strong influencing factor. The book, The Rhine flows into the Tiber, chronicles the events in some detail. Amen. And so with our 'handed-down' constitution which is now being destroyed by barely-read experts with ideas, the better to consolidate power in their sticky little Oxbridge mitts. May I presume to contact you via your blog, Father. Like you, I am not very adept at negotiating the web to find contact info. We are asking the assistance of Catholic priests around the world with a project that came in prayer while offering the daily office and, in particular, while praying Psalm 44. A wave of Mass offerings and mail going to the Cardinal can be a great spiritual grace for all of us during these very dark days. Since the Cardinal has no access to electronic media, please mail (via Royal Mail or national mail systems) send your Mass cards and messages to the following address -- Australian law requires that mail be delivered under penalty of felony. I recall a step by step introduction of the vernacular. I do not know whether Rome said this was optional, but dioceses seemed to impose uniformity. It is possible that this was a mindset requiring uniformity, or it might be a fear (probably well founded) that some parish priests would absolutely resist change while others would abandon Latin completely. Some dioceses certainly banned the use of Latin (e.g. Baltimore). There were also changes to the rubrics, which did not impinge on the congregation much. All this before the promulgation of the new rite, which was not permitted in England (as far as I know) until it had been translated into English. Dear Father. It is a truth unacknowledged publicly by The Catholic Church that it is due solely to The Holy Holocaust that the world continues in its existence. Said otherwise, if the Holy Sacrifice of The Mass ceased, the world would come to an end owing to the incalculable amount of sin by man that would cause God to smite man with vengeance were the Holy Holocaust and the sacramental shedding of blood not exist to appease His anger. The single holiest action on earth at any time is The Holy Holocaust and from The Bishop of Rome to the local Bishop of almost any fateful Catholic on earth there is not one by whose action a man would think - Yeah, he gets it. ABS literally can not understand the indifference to this existential truth. For those happy faithful who read you, it would be good for them to consider buying their favorite priest a quality gift for Father's Day - Maundy Thursday - or to take them out to a restaurant in Kensington for a meal of roast lamb and some quality wine after Easter. It is not the POTUS, it is not the Secretary General of The United Nations, it is not the Prime Minister of any country nor is it the most intelligent scientist alive whose job/vocation is the most important and most crucial vocation on earth; it is the Priest through whom Jesus works. Happy Father's Day in advance, Father. ABS hopes some faithful Catholic takes you and your Bride out for dinner and drinks. A determined cadre with a predetermined agenda will always win against an inchoate opposition, whether in the Bolshevik Revolution or the post Vatican II maelstrom. "Bishops felt that they themselves didn't really know about Liturgy and were glad to be able to leave it to The Experts." Funny, I always thought the liturgy was the principal function of the Bishop. Maybe back in the day before Bishops started to see themselves as the CEOs of an NGO primarily involved in "social justice" initiatives. Too many of the bishops where I live on those days were narrow-minded bureaucrats who had never had a time though in their lives and we're utterly lacking in liturgical sensibility. Has anything changed, one wonders?